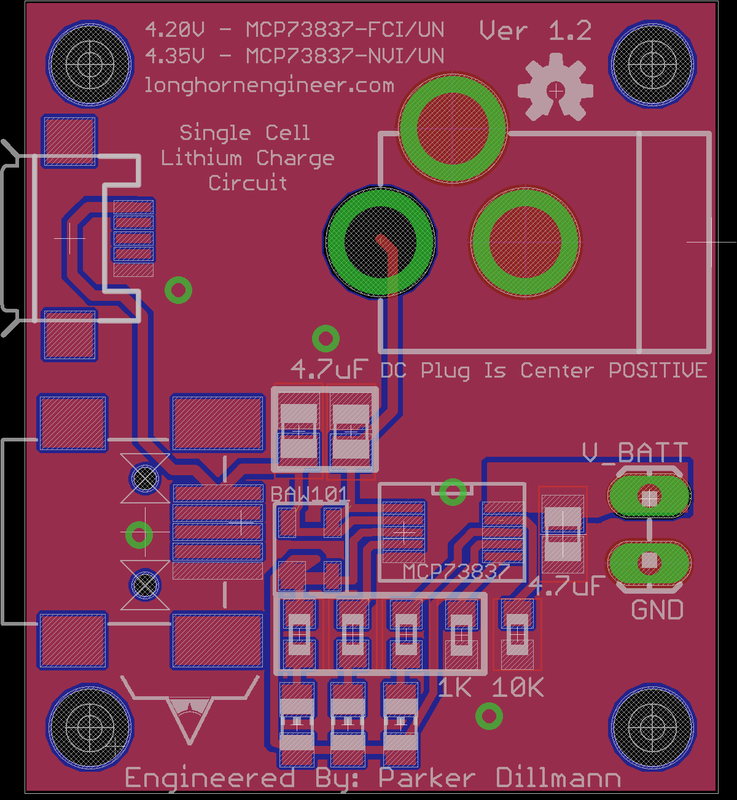 Single Cell Lithium Battery Charger Circuit Ver 1.2 Released! This circuit is designed around the MCP73837 chip. There are a couple different versions of this chip which allows the same PCB have a charge cut off voltage of 4.2V for normal lithium batteries and 4.35V for high capacity lithium batteries. It charges via USB at a rate of 500mA or an external power supply rated at 5-6V at 1A. I would use a power supply at a rating of at least 1.2A for this charger. Added a micro usb plug to compliment the mini usb plug and DC power jack. Made all the passive parts 0805 size to make the board easier to assemble. Tweaked the mounting holes a bit as well.